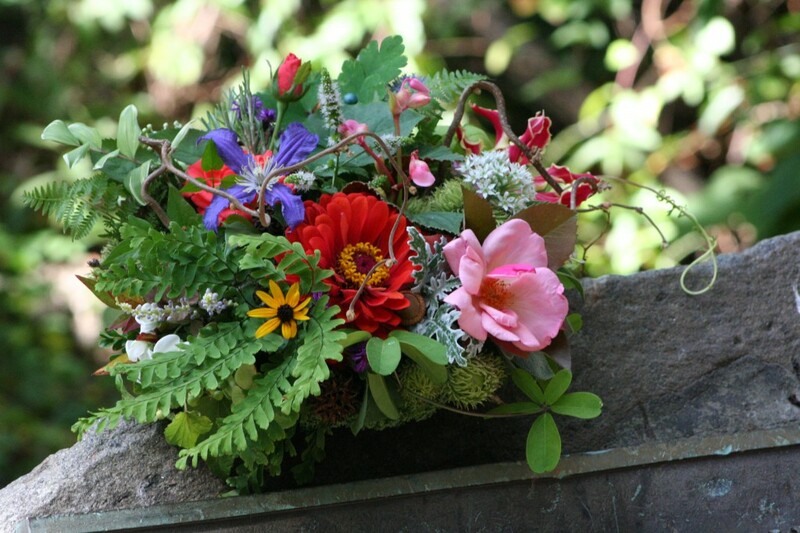 This is my garden inspired bouquet, using what I could find still in bloom in the late summer heat. I bought the kale leaves and glued them to the underside of the bouquet to start, and glued a leaf to cover the handle. Flowers were collected and cut from the garden and our potted plants and I got a nice mix of flowers and leaves, pods and acorns. It was a race against the rising summer heat in the studio, and I wanted to get photos done while we still had good light outdoors. After I finished I asked Frederick to go with me over to Fort Bunker Hill Park here in Brookland to do the photographs. It is a lovely place to shoot photos, but sadly is FULL of poison ivy, and now Frederick has it all of his legs and feet despite our attempts to be careful. Since then I have scouted some better areas to shoot photos in with less chances of getting into poison ivy. My original idea was to do cool colors, but with a limited amount of flowers I had to go with many colors instead. Perhaps the next one will be the cool colors using some local flowers from the farmer’s market to add to what I have in the garden. 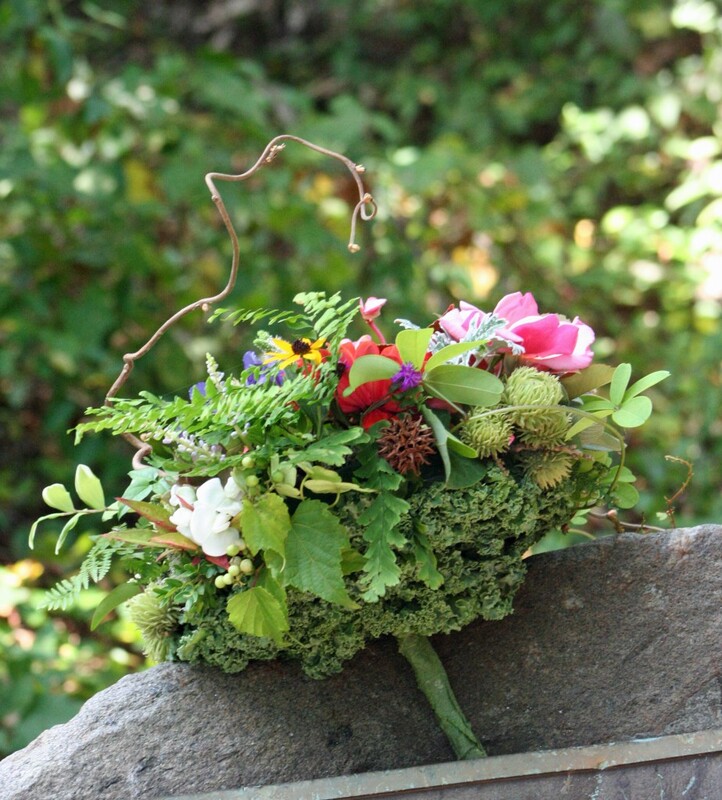 I will also be posting photos of the bouquet I did earlier in August using materials collected from the woods in the mountains and my mother’s garden, hopefully sometime this weekend. I absolutely love this bouquet. It is so unique. If only I could find a way to replicate it in Washington state in early spring. You might want to read this article posted in the NYTimes last week http://www.nytimes.com/2013/12/29/fashion/weddings/the-farm-to-centerpiece-movement.html?ref=style&_r=0. 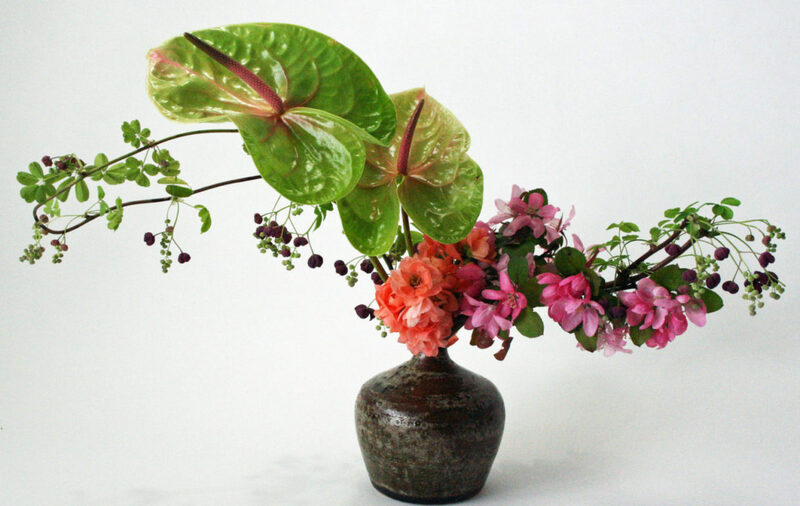 I think some florists who are really into the local/seasonal flowers movement could really do something special for you that might be similar. 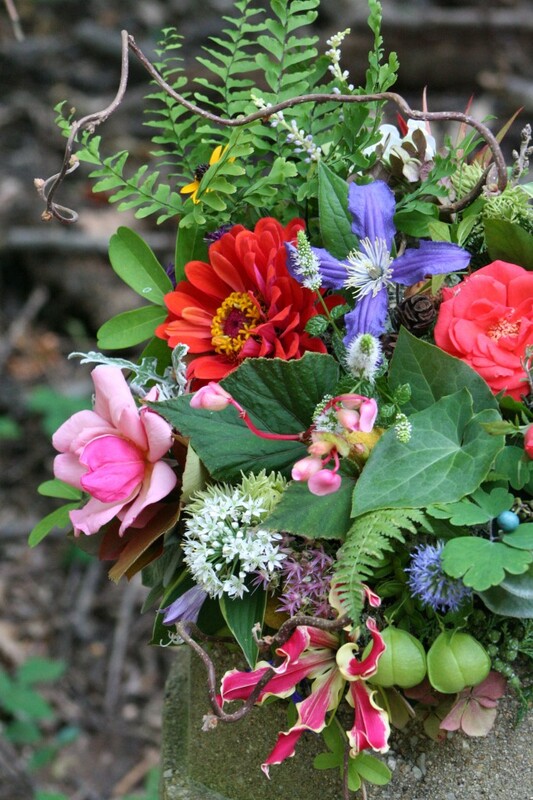 The book “The 50 Mile Bouquet” is also an excellent reference for the local flowers movement.